Former U.S. Rep. James Leach (R-Iowa) has had a varied career in Congress, foreign service, as chairman of the National Endowment for the Humanities and as an educator at Princeton University, Harvard University and the University of Iowa. 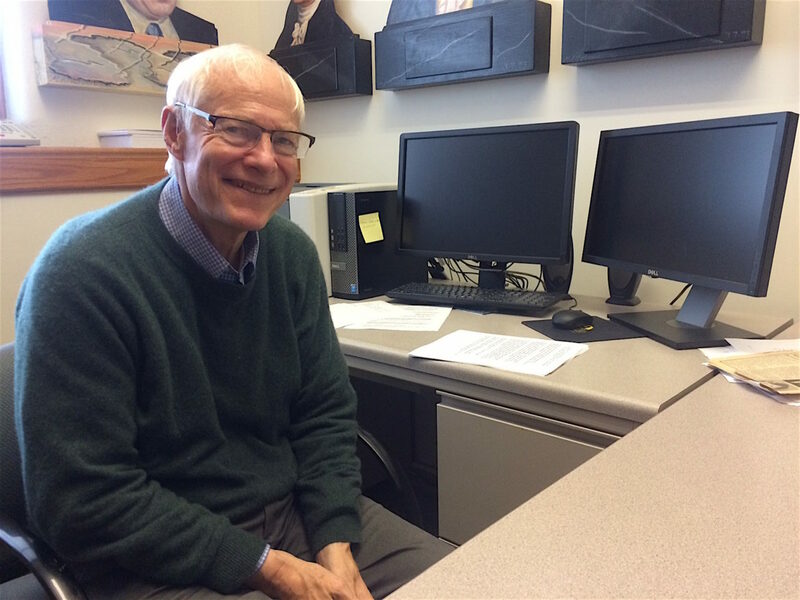 This photo was taken in his University of Iowa political science department office on Oct. 10, 2018. DON’T MISS AN IOWAWATCH STORY. Some Americans may think their country is divided politically more than ever but political acrimony was more serious, and sometimes violent, in other times in U.S. history, former long-time U.S. congressman James Leach, of Iowa, said in an IowaWatch interview. Even so, Leach also said in the interview that politics in Congress is more divisive, which includes more personal attacks on political opponents, than when he served. “There’s a personalization of all of politics,” he said. Leach, of Iowa City, is a visiting professor of law and senior scholar at the University of Iowa College of Law and a visiting professor of political science at the university’s College of Liberal Arts and Sciences. Other harsh times in U.S. politics, he noted, have included early in the nation’s history when founders Thomas Jefferson and John Adams hurled insults at each other, President Andrew Jackson dueled opponents and when Vice President Aaron Burr famously killed the first U.S. treasury secretary, Alexander Hamilton, in a duel. Leach, a former chairman of the National Endowment for the Humanities who spurned his party to support Democrat Barack Obama for president, said he still considers himself a Republican. He said he is in the mold of moderates in the party’s past like former President Dwight E. Eisenhower and former Iowa Gov. Robert Ray, and that he would not agree with much of today’s Republican Party leadership in Congress. Simply defining populism is a chore. But evaluating whether or not populism is good or bad is a whole other task. IowaWatch was part of an “Ethical Perspectives on the News” program exploring those ideas.